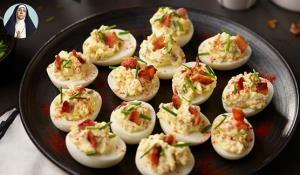 On Tuesday February 12th during the IPPE the AEB presented Deviled Egg Power Hour on booth C10624 at 16H00. The AEB leadership team including Chairman Jeff Hardin and CEO Anne L. Alonzo will host. Market development Senior Vice-president John Howeth, VP marketing, Sofia Therios and the Director of the Egg Nutrition Center, Dr. Mickey Rubin will be in attendance.